Are You Keeping Your Customers� Satisfied? Plan On Becoming A Valued Intra-preneur! 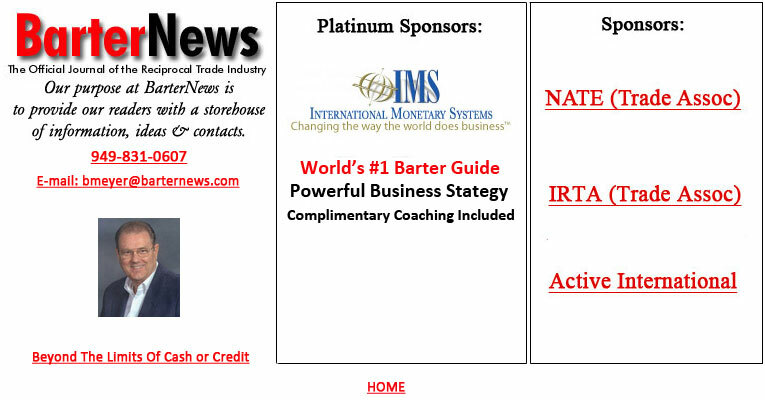 Value Subjective, Not Objective...That�s Why Barter Is So Exciting! - what is a win-win economy? - should volunteers be allowed to spend their credits? - who owns volunteer credits? - can the win-win economy replace the rule of violence? resource. They can be developed using win-win principles to bring new benefits to volunteers, agencies and the community served. We need to develop volunteer hours as a new kind of currency to address the growing needs left unmet by the money economy. Government agencies at all levels are starting to look at community service schemes to make ends meet, but they can't afford to create and supervise the service jobs. This is an opportunity for the non-profit sector. "Spiritual Currency" describes how to develop volunteer credit systems from the bottom up, so that community values are served first, and validated community service credits are generated for reimbursement by government and other funding sources. Volunteer credits are much more than a means of attracting funding. They are a prototype of win-win currency, held jointly by volunteers and agencies, and created at the grassroots to carry the shared values of those involved. These are win-win values, closely identified with spiritual values, or, for the secularly inclined, values of cooperation, mutual aid and personal development which lead to general abundance. credit system, not only will they help our community directly, but the money will follow. Furthermore, such a system functioning on the local level can be a model for creating a win-win economy throughout the world. currency, bringing credit to both the volunteers and the organization that records them. We will also be looking at VH as win-win capital, accumulating over the years as the total contribution made by each volunteer and each organization to the community. credits are earned by the student, are kept in the records of the school, and measure the performance of the teacher and school as well as the student. They accumulate towards a degree, a kind of academic capital which the graduate keeps for life. If the schools agree, a student can transfer credits from one college to another, and we will be looking at this kind of mobility for volunteer hours. In fact, convertibility will be a way of validating VH as currency and maintaining standards for the organizations that produced them. community service credits which can be exchanged for government benefits. And VH that are standardized and mobile can act as an alternative currency, tying together non-profit and voluntary groups into a win-win economy. VH can help to run a volunteer information network, bringing the wealth of information to those who need it most. Those in the volunteer economy need never be information-poor. Vice President Albert Gore has promised us an "information superhighway," but looks to the non-profits to provide the grass-roots delivery systems. when, if the hours are recorded at all, they may perhaps be worth some matching funds for the agency and an awards luncheon for the volunteers. Their full potential remains unknown and undeveloped. Currency is whatever is in current use as a medium of exchange. Oh, how temporary that sounds! Money sounds more solid and stable -- at least until we look at it closely -- and we shall use the word money for traditional win-lose currency. a more accurate word. Whereas money comes from on high and is passed around anonymously, win-win credits are created at the grassroots by two parties who have both their names on them. Circulation and exchange are much more limited. But the idea of currency can help us understand these strange new critters. everything and it needs some other kind of currency to take some of the load, to fill in where money doesn't reach. the value has been taken out of it, it's no longer backed by precious metals, and all that's left is magic. Pure faith. Our belief in each dollar keeps it going. the poor, since the value of money rests on scarcity. Money is created at the top of society and trickles down only so far. The creation of money and credit is an unearned bonanza for rich banks and financiers, not for the people who need it most. There's a need for some kind of currency and credit creation at the bottom of society to fill this money void. thanks to automation. Computers make products cheap and workers redundant. The results: lower prices and less spending money. The money economy is in danger of contraction, a process that could lead to monetary collapse. Requiring community service credits in exchange for government support is a move in the right direction. Beyond that we'd like to see these credits acquire value in their own right and trade directly with the money economy. Community service requirements can give volunteer hours the boost they need to get established, but the point is not just to distribute aid more efficiently. The goal is to build a new economy with these volunteer hours so that aid will no longer be necessary. WHAT IS A WIN-WIN ECONOMY? The economy started out from a Greek word meaning good housekeeping, and expanded into the complex system of inputs and outputs, mediated by money, that holds us in thrall today. Economics has generally been applied to scarce resources -- land, labor and capital -- following the material win-lose model, which says if I have something, you don't. typically the things money can't buy. A win-win transaction might be having a conversation or playing together. Both sides gain in the process. In addition, they build up friendship or informal credit with each other, a kind of win-win capital. Back before money, the distribution of work and rewards depended on friendships and informal credit, as well as kinship and brute force. Today, in the worlds of business and politics, this informal economy continues to thrive. deal only in money find our community ties broken. That is one reason we may turn to volunteering: to recover the traditional non-monetary relationships and sense of community. traditional base that we will build something new and powerful, leap-frogging over money to provide a higher order economy for the next millennium. The traditional informal economy of human relations has no currency, and we like it that way. Why would we need a win-win currency? We need a win-win currency to extend our economy beyond the people we know and to build a win-win economy that can play a part in running the world. We don't need a currency to relate to our friends, but we will need one to relate to institutions and the wider world. economy already exist. Which institutions currently address those needs neglected by the money economy? These are the non-profit agencies, churches, charities, voluntary groups and government services. network, with offices, staff, funding and a major production and delivery system of goods and services. It's already focused on the areas left out of the money economy, both the people without money and the values ignored by the economy. And it already generates volunteer hours in substantial quantities in every community. currency, and each chapter will unfold a new perspective. Our values and beliefs form much of the subject matter, for these are more important components of a currency than accounting techniques. So this is the first product of the win-win economy: learning something new and transformative. For everyone, the win-win economy starts with education. Before any change occurs in the world, a change occurs inside. suggests something that embodies higher values and win-win principles. it invokes fantasies of a world run on those higher values, producing peace and abundance for all. Can we create a spiritual currency? The question rightly points at us. accustomed to look outside for money, and accept whatever values it represents. do the participants in a win-win transaction gain? Where does it come from? These are vital topics for discussion. usually feel good, and gain some energy from the transaction that is called by the same name in both religious and secular traditions: spirit. uncontroversial. "Spiritual" refers to the unobserved source and mechanism of spirit and causes endless argument. Volunteers work for both spiritual and secular purposes. No particular belief system is required, and the volunteer ethic and the win-win principle are held in universal high regard. Volunteer hours should prove to be a worthy medium for those who wish to manifest spiritual principles on earth, as well as for those who just want to make the world work. Volunteer credit systems can be developed in stages. Each organization can decide which options to adopt at its own pace, and may even test out options on a project or subprogram. It is important to secure the agreement of everyone involved before making changes. Thus education becomes the first stage, with workshops and discussions for volunteers and administrators on the principles involved, and how to implement them in the organization's particular case. potential of volunteer credits takes a while to grasp. Developing volunteer credits is an evolutionary process, studying and applying each step in turn while getting a better view of the goal where these steps are leading. contributions of volunteer hours. These can be given new recognition and value, knowing what they can become, and will become a factor in publicity and motivation. Next comes the experimental stage, where specific options are tested out on a new project or program. These options will include: clients earning credits; volunteers spending credits; credit transfers and networking with other agencies; voting credits; credit for donors; community service requirements. The experimental stage may start with one organization but will develop as a cooperative project community-wide, where different groups test different options, interact with the networking options, and learn from each other which options work. Then there is a consolidation stage where groups extend their options, leading to a commitment stage where they make all their credits transferable, and adopt businesslike accounting procedures for volunteer hours. evaluate and decide how far to go and how fast, where to stop and what the future potential may be. Today many organizations put their records of volunteer hours to use as one measure of the group's contribution to the community, for the purpose of securing funding and facilities. Thus VH records are already a factor in the non-profit economy, and actually generate income. Some organizations are leveraging their volunteer hours to get grants. Some say their volunteers are worth $10 an hour for matching funds. These are the beginnings of viewing volunteer hours as an economic resource and tradable currency. It's a view still rooted in the money world, valuing volunteer hours in terms of money. We have yet to tap the win-win values that are potential in volunteer hours. present obscurity and pay for their early development. agency can claim, "23,000 volunteer hours contributed to the community since 1979." The volunteers will also enjoy seeing their individual totals. To produce these numbers, the organization must conduct a volunteer credit inventory. This can be done by following the records back as far as they go, and then asking the volunteers and administrators to fill in the gaps. This simple first step will demonstrate how each such step adds value to VH. The agency gains an aditional statistic for fundraising. The volunteers gain an additional measure of recognition. The volunteers will feel the hours they log are more valuable. That is a motivation to work more hours or stay with a job rather than quitting. And more VH means more funding. saying that they are worth more than previously thought. Part of this is the promise that VH will be developed to produce future benefits. And part of it is recognizing the intrinsic nature of volunteer hours and volunteers as embodying a higher value system and worthy of our attention and regard. If we value volunteer hours, we value the volunteers, we value people. We value people who serve. These people become the source of the values, the creators of the currency. There is no shortage of this currency. Anybody can create it by working an hour. instead gets credit. This credit builds up and represents the value of the volunteer in the community. Volunteer credits make people the source and repository of value. The credits accumulate as human capital. In contrast, money values machine capital. As machines replace people, the machines earn the money and the people have none. Money is becoming an alien value, dedicated to keeping the machines alive. results with its volunteers, showing each individual's accumulated credit. This can be followed by regular statements to all active volunteers, showing how many VH they earned in the month and how their totals have grown. some kind of permanent credit or currency that the volunteer now owns, and that this accounting entry is somehow equivalent to the hours that were worked. totals are preserved and new hours added to them. The statements look likebank statements, making VH look even more like money. The volunteer can now feel ownership of the credits, see them mounting up, feel good about them, feel good as a person, being worth that much. It's like a bank account, maybe the first for someone who's young and unemployed. It introduces a sense of time and progress. And all this before adding any explicit value whatsoever to the credits. disappearing into the ether, but preserved in these accounts. The credits even have the same name: volunteer hours. The volunteer will tend to give these symbolic VH the value that went into the original hours. from the agency or any incentives or uses for VH, but from the volunteers themselves. If future uses are promised, this may facilitate the process. But the principal early input of value to VH can come from the volunteers themselves, identifying their credits with the energy and ideals that went into them. it every day with our dollars. Now we get to some controversial uses for volunteer hours, which each group can debate whether to adopt. way, they didn't work any hours. But if the rate is set very high, say $50 or $100 an hour, the volunteers may feel pretty good about it. They may not have much earning power in the money economy, but in the volunteer economy their hours are worth $50 or $100. This sets the tone for VH, as being somehow more valuable than ordinary commercial hours. As we develop volunteer hours as a win-win currency, we may find that this is so. Why should donors pay so much for VH? Well, they were going to donate anyway. The rate doesn't matter to them. The volunteer hours are just a bonus. But they're more than that. Donors will get a statement at least once a year showing their VH balance, and they may be encouraged to volunteer. If VH are treated as voting shares it gives donors a stake in the organization. And donors will also have access to the future uses of VH that may be developed. Offering VH to donors is a fundraising incentive and it involves donors in this experimental new value system, as well as giving them a continuing interest in the groups they assist. encourage members to show up to meetings, to exercise their power. It recognizes the workers in the group and gives due weight to seniority, to the people who have accumulated credits over many years. Not that long-established groups would adopt such a radical change of governance. This is more likely to appeal to new groups starting from scratch. But all groups should consider expanding their definition of volunteer hours. Officers and others who show up for business meetings should get credit for their time. Telephone time and travel time should count. If we're creating a new currency, let's create as much as we can.